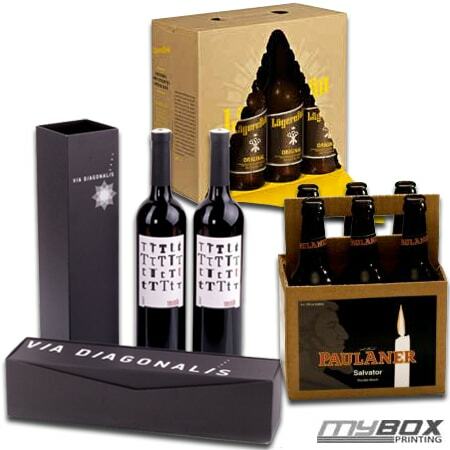 My Box Printing offers wide range of beverage boxes production. All custom sizes are available. What so ever your bottles or beverages are, we offer finest quality packaging materials and boxes. We have wide selection of self-assembly corrugated boxes with full colour printing and Gloss or Matte lamination. Fill out request a quote form now for best price and free delivery options. Share your product, dimensions, logos, custom messages and other graphics so we can provide you with free digital proof. Our beverage packaging services are not only for all major producers of juices, drinks, chemicals, wine gift boxes, pharmaceutical liquids packaging but also for hazardous liquids, perfumes, beauty products, toiletry bottles also. You can have an amazing product, but without good packaging the brand will not achieve highest level of sales. Custom beverage boxes will not only protect your product from damage but will also play an important role in your brand awareness campaign. Contact us now for high quality branded beverage boxes in UK, Germany, France, Denmark, Belgium, Norway, Sweden, Italy or any other European country. My box Printing supplied us 10,000 full colour custom logo based cardboard boxes. The thickness, quality, packaging and price was impressive. This corrugated cardboard printing supplier are highly recommended. Good work mates ! !